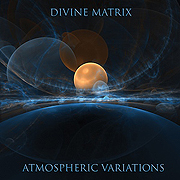 Playing across 11 tracks, the music on Atmospheric Variations (75'51") by Divine Matrix changes much like the weather does. With each passing song the listener is exposed to different intensities of light and subtle variations in mood. From bright motion filled sonic landscapes to overcast hollows of introspection and twilight realms where ambient space seems to become a physical location, Steve Barnes (the man behind Divine Matrix) drifts us through a unique musical climate. Incorporating squelching radio travel advisories and environmental field recordings along with ever changing layers of lush synthesized sounds and tight sequencer runs Atmospheric Variations fits in well alongside works by more established British Contemporary Instrumental artists such as David Wright, Bob Holroyd and Paul Lawler. Yet by keeping the energy level contained, sustained and crisp Barnes has realized an enjoyable work somewhere between the gloss of New Age and the Minimalism of Spacemusic. As we listen, undulating drones soon give way to echoing electronic tone patterns, above which heroic keyboard lines expand in a ribbon of melody, while further on the energy dissipates in deep digital chords and dark clouds of reverb. Beautiful piano notes amidst smartly arranged effects and rhythms produce cool compositions beneath the sound of rain and rolling thunder - effectively contrasting the more upbeat action pieces. Atmospheric Conditions renders the blue and white of the sky, the gray of a storm and the dark of night into a wonderfully detailed aural experience. The music is more than transportive, with its most prominent feature being its attitude of hope - and the forecast of a new and better tomorrow.